At 9:30 yesterday morning, Turkish citizens opposed to their government’s war policies gathered at the Ankara Train Station for a demonstration organized by a broad alliance of organizations: the country’s two main oppositional labor unions (DISK and KESK), the national Chamber of Architects and Engineers (TMMOB), the Medical Association (Tabipler Birliği), and the June Movement (Haziran Hareketi) formed in 2013 to give lasting organizational form to the Gezi Park protests, to name a few. Shortly before ten o’clock the group began its march toward Sıhiyye Square where from 12:00-16:00 they were to hold a rally titled “Stand Up to War, Demand Peace Now!” (Savaşa İnat, Barış Hemen Şimdi). There is no question whom such a rally benefits: Turkish society, but especially the citizens of the war-torn southeast, whether Kurdish, Arab, or Turkish; the families of soldiers in Turkey’s conscript army, whether or not they agree with the state’s war aims; the working class of Turkey, which needs to unite against those who would splinter it along identitarian lines. There can be no question whom it challenges: those holding onto power in the saddle of sectarian strife, manipulating ethnic and religious hatreds to cover up their on-going massacre of workers, women, and minorities. There can be little doubt that these words apply as well to the AKP as to the fundamentalist gangs it has been accused of harboring and arming for battle in Syria. 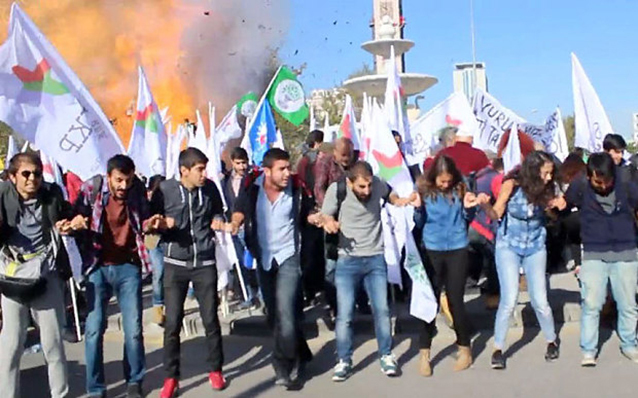 Explosions interrupted a demonstration in Ankara, leaving numerous dead. Doubtless the government will think little about things having been laid so far out in the open. Turkey’s “neighbors” in Syriza may declare that “the Erdoğan government (sic?) must answer for its attacks against democracy and peace in Turkey and the surrounding region,” but pro-government figures like the organized crime boss Sedat Peker will go on making statements like “when our self-defense is at stake, we will let their blood flow by the ditch-full,” delivered to applause at a rally in Erdoğan’s ancestral home of Rize the day before the attack. They’re just words, after all. Just as pro-government journalist Cem Küçük could write to rival Ahmet Hakan, in print, “we will crush you like an insect,” and then act surprised when three thugs with AKP party membership assaulted Hakan in the street. The author is a freelance writer and educator based in Turkey whose political commentary has appeared on MR Zine and LeftEast, where this article originally appeared.